We all have our predisposition when it comes to shooting. Mine is one of the worst ones to have as a speed shooter, I always try to go too fast! In a previous post I have discussed the topic of the “EDGE”. In lieu of rehashing the details of this concept I will share the basics. The EDGE is the point where your basic fundamentals of shooting breakdown IE you move your eyes to the next target prior to fully depressing the trigger and firing the gun. Everyone’s EDGE is very different, but with some experience it is easy to find. 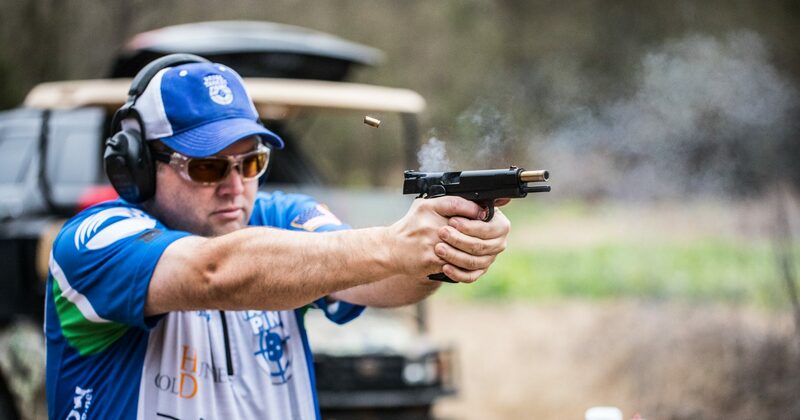 I started shooting my Carolina Arms Group Trenton Pro 9MM this year in Single Stack and I have struggled getting consistent times. While doing some trouble shooting I discovered the accuracy out of a plated bullet is not what I needed and therefore sought out a Full Metal Jacket Bullet and discovered Precision Brass and Bullet 115grain FMJ with the help of my friend Steve Cole. After doing some testing the true potential of my 1911 was unleashed. MD Ammunitions does amazing work and found that 3.7 grains of Western Powders Competition was delivering reliable results at 1050 FPS. As I started analyzing my times, I was absolutely struggling coming out of the holster. The beep went off and I thought I was going to yank my belt off with my gun. I realized this had to do in part with my poor technique, but then I ordered a Red Hill Tactical Holster. The fit and finish is top notch and now I know why so many people were running their holsters. I still was not at the level of drawing my gun in as smooth of a fashion as I should be, so after some discussions with Tom Naelon, I purchased the Safariland USPSA kit. This allowed me to make a couple of small tweaks to the draw angle and I was more confident then I have ever been! Despite steady progress in Single Stack and my first major win in the division, I have a long way to go. One of the stages I feel can help my overall Steel Challenge game is Five to Go. Last night I setup the stage and began to run some strings. I knew in the back of my head that the peak time for Five to Go for Single Stack is 13.50 (four strings) or 3.375 seconds a string. In order to be classified as a GM I would need to shoot 95% of this time and each string would have to be (3.375 secs * 1+.05%) 3.54 seconds. The very first string I shot at my predisposition pace was 3.27 seconds with a 1.33 draw. As I have seen in the past, I had a miss on one plate that I did not make-up. I tried to shoot a couple more strings at this pace and then realized I was shooting past my EDGE and my fundamentals were breaking down on plate #3. It was interesting, I tell people with this stage the transition from plate #1 to plate #2 should be the fastest transition and then plate #4 to the stop plate, but my times were showing me something else. I was accelerating from plate to plate which can be okay, but I needed to be careful. The total time was 3.56. Albeit this is just over the GM time, I would take it. My third string I was focused on doing this one more time and my total time was 3.57 seconds. What does this all mean? My true EDGE for Five to Go is close to the 3.50 second mark. When I was having faster times I would sometimes connect, but then I was missing the 3rd plate and sometimes the 4th plate. My focus is to shoot at my current level of ability, this is tough, but something I am working on. My other area of focus is and has been to work on my draw. I am confident I am leaving between .2-.3 seconds out on the table on this stage. This adds up to 1 second a stage and close to 8 seconds for a match in this division. I hope the training insight I had out on the range helps you and offers a little insight on how I work on a division and a stage to get better. See you out on the range soon! Thanks Steve. Love these articles! Keep them coming.